For the last several months I've been reading a blog called The Amateur Gourmet. Five years ago Adam Roberts either was in law school or had just graduated from law school, was not happy in life, and started a food blog. Since then he's had a show on Food Network, published a cookbook, and kept blogging. He did a list of his greatest hits, which included Cavatappi with Sun-Dried Tomatoes, a recipe he got from his favorite TV Chef, Lydia Bastianich. So, earlier this week I decided to try it. I knew that I had garlic, red pepper flakes, and sun-dried tomatoes, and stopped at our local natural foods market after work, since it happens to be on the way home. I didn't print out the recipe or even check before we left, since things got a little rushed at the end of the day, but I wasn't too concerned. We walked into the little store, and saw their baby portabella mushrooms. I often make a pesto pasta with artichoke hearts and portabellos and figured they'd work in this meal, too, so I had Craig get a bag of them. I knew that we didn't have cavatappi pasta, so I wandered over to the pasta section. Neither did they. What they did have was a lot of pasta made with whole grain, quinoa, and various other health/specialty ingredients. I have a pretty opinionated sense of taste, and the "healthy" pastas just don't taste good to me. They did have one brand of durum semolina (normal) pasta, so I picked out the kind that seemed like the best option, which turned out to be pipe rigate. I also needed beans. I couldn't remember the name of the beans from the recipe, but knew that they were white. I debated between canellini and great northern beans. I went with the canellini, which it turns out are white kidney beans, and was happy to see that I had picked the right one when I got home and checked the recipe. We got home and I brought my laptop out to the kitchen and pulled up the recipe. I read it over and went to get the other ingredients. I pulled the jar of sun-dried tomatoes off the pantry shelf, and found that they were not, indeed, sun-dried tomatoes. The jar was actually sun-dried tomato pesto. I thought about going back to the store for about half a second, shrugged my shoulders, and put it on the counter with the rest of the ingredients. 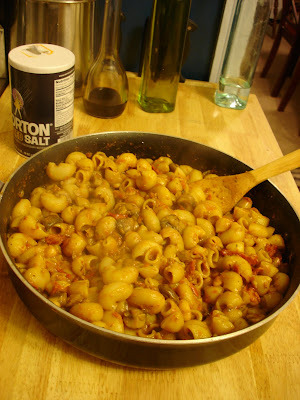 I then sauteed the portabellas, and when they were done I added about half of the jar of the sun-dried tomato pesto, with enough of the pasta water to make it seem saucy, not in danger of burning and not soupy. When that seemed hot, I added the cannellini beans. After they warmed up, I tasted it and it seemed kind of bland, so I added the rest of the pesto, a little bit of balsamic vinegar, and some salt. That seemed better. I had to keep adding pasta water to keep the mixture the right consistency. I had been cooking the pasta, and it was finished at about the right time, so I drained it and added it to the sauce, stirring it all together. Amusingly, the open ends of the pipa rigate were apparently the right size for the beans to fit into, and many of the beans proceeded to do just that. In fact, when Craig was eating the pasta, he mentioned that he thought I was going to put beans in the dish. He hadn't seen any, since only a few were left in the sauce, outside the pasta. This dish actually grew on me as I had it for leftovers twice after the first evening. I think it's because of the beans. The first night they seemed out of place in the pasta, with a distracting flavor and chalky/grainy texture (I'm also particular about beans, tending to like smaller and smoother beans like edamame and black beans much more than the larger beans). Later, after they'd had time to absorb more flavor, and probably change texture a little because of the microwave reheating, they seemed better integrated into the dish.